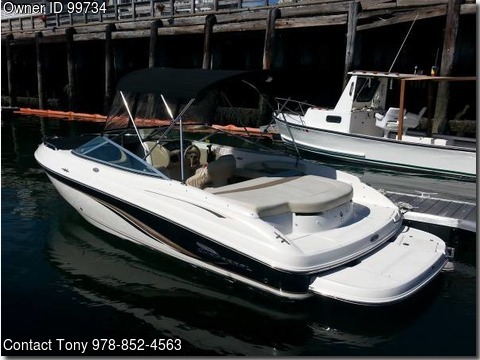 Boat is located in Peabody,Massachusetts.Please contact the owner @ 978-852-4563 or teka11@verizon.net...New engine,only 20 hours.Snap out carpet,Ritchie compass , depth gauge etc.flip up bolster seats, all gear include skis,tow rope,2 anchors,life jackets,spare prop,etc. . bow and stern ladders , stereo w/4 speakers, walk through transom w full filler seat,3 live bait wells, built in cooler in bow seat,plenty of passenger and storage room. EZ loader trailer w swing away tongue , dual axle.New battery and fresh bottom paint.